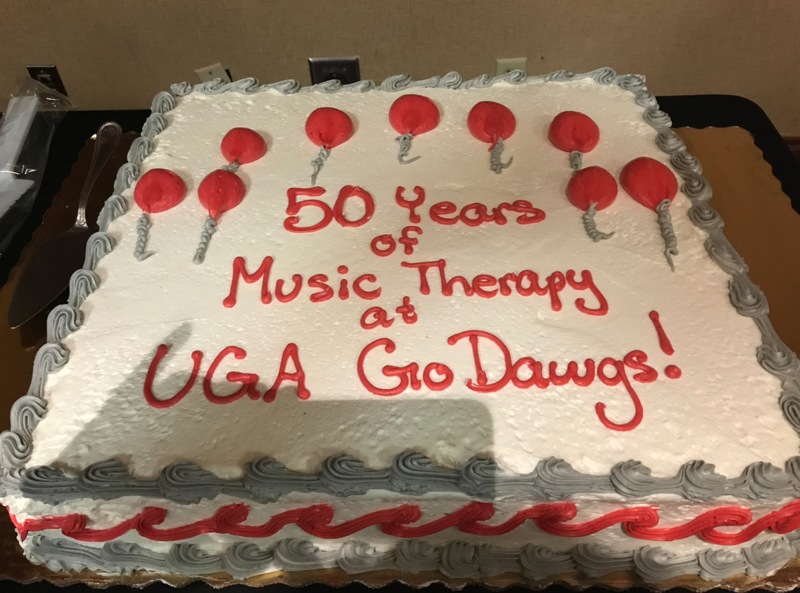 At the Southeastern Regional Music Therapy Conference, the University of Georgia celebrated 50 years of music therapy study at UGA. 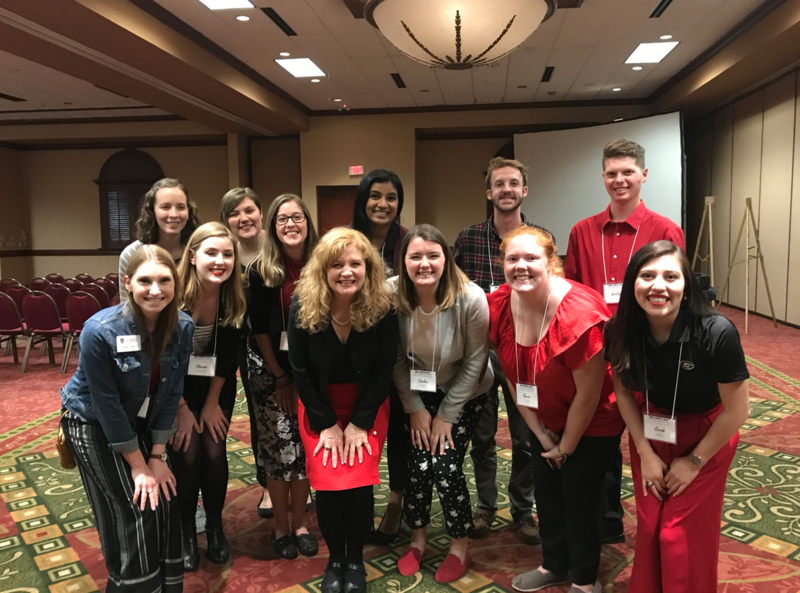 Many of our music therapy team attended the University of Georgia, as well as previous team members and interns that have been through our department. Congrats to our colleagues for reaching this milestone! Music Therapy and Guitar: Have we kept pace with the profession? 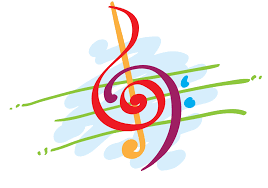 What skills do Music Therapy Interns feel would improve their guitar playing? Do Interns account for the use of the guitar when planning music therapy activities and treatment? Which formats do Music Therapy Interns believe would best help them reach their guitar goals? 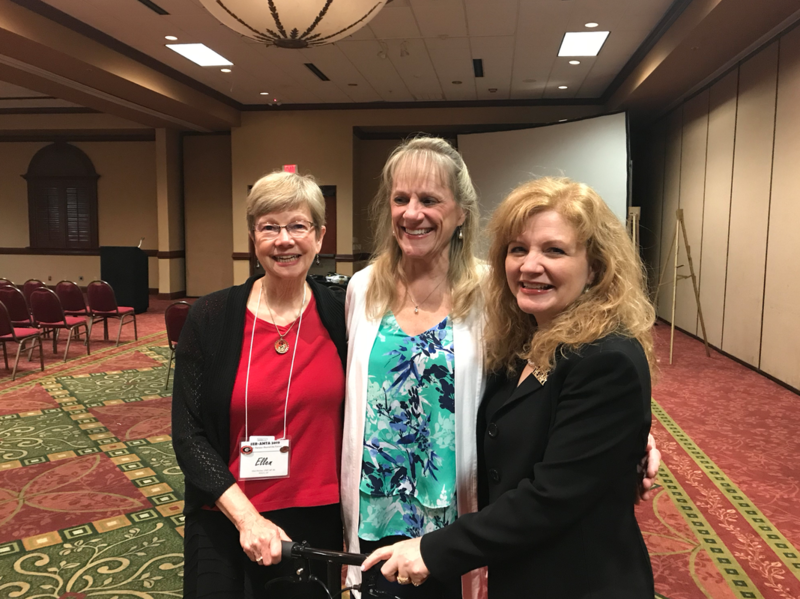 It is our hope that we can open the discussion that will bring a renewed emphasis on the importance of using the guitar as a tool in music therapy. 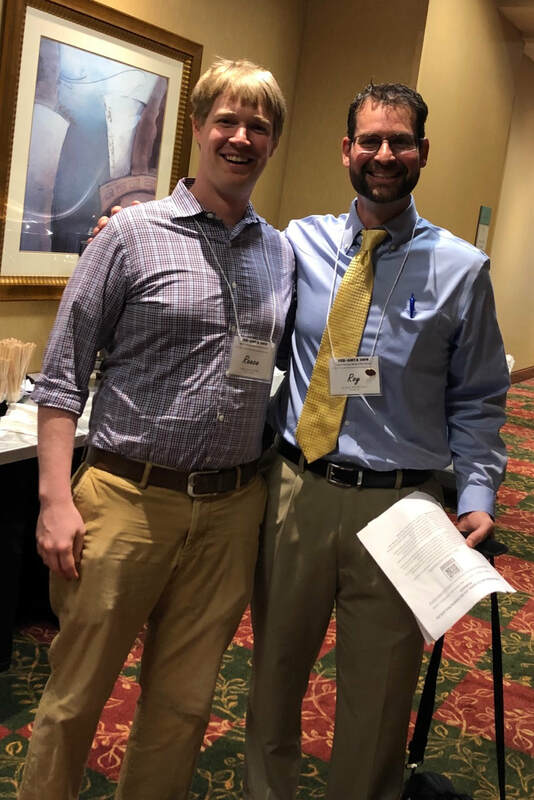 In addition, how we as professionals and intern supervisors can advise programs on how prepared students are when it comes to meeting the guitar needs of the profession. A copy of our survey can be found at this link." James Hiller and Susan Gardstrom wrote an article about the risks in all different types of therapies. They state that taking risks is necessary for any significant and enduring change to occur. Specifically, as music therapists, we must be educated about risk-benefit ratios for people who use our services. For example, Hiller and Gardstrom wrote that a possible risk in music therapy could be found in listening experiences. While listening and dancing to the music can be a great stress relief or form of self-expression, some people could find the situation over stimulating and confusing. It's up to each music therapist to understand the environmental situations/clients and make the best therapeutic choice for all involved. You can read the article here. Thankfully, in Georgia and in Fulton County Schools, all our music therapists are board certified by the Certification Board for Music Therapists, as well as licensed by the State of Georgia ensuring that we have completed proper education prior to practicing music therapy and ensuring that we are continuing our education to stay up-to-date on best music therapy practices so we can always have a great understanding of this risk-benefit ratios. 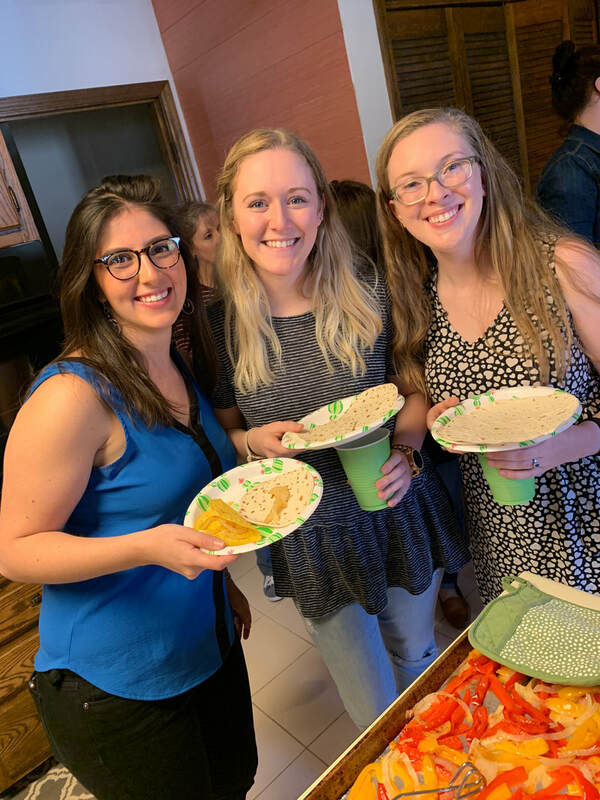 On Saturday March 23rd, many of the music therapists and all of the music therapy interns gathered at music therapist Tasia Carter's house for a celebration of our current interns. The interns are finishing up their last week in internship and getting ready to say their goodbyes to all the students. Congrats on a job well done, interns! We can't wait to see what you all do in the future as professionals. 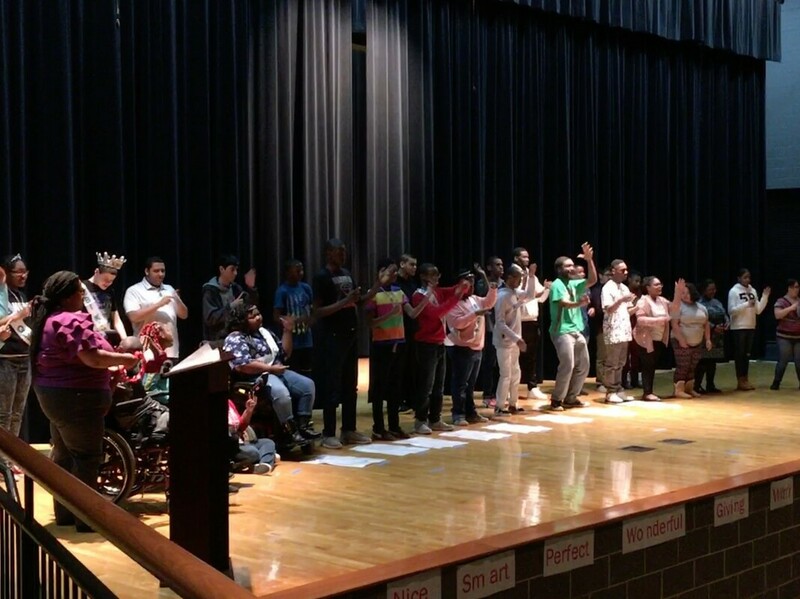 On Monday March 18th, Community Based Instruction (CBI) students at John's Creek High School took the stage for their annual show, John's Creek Idol! 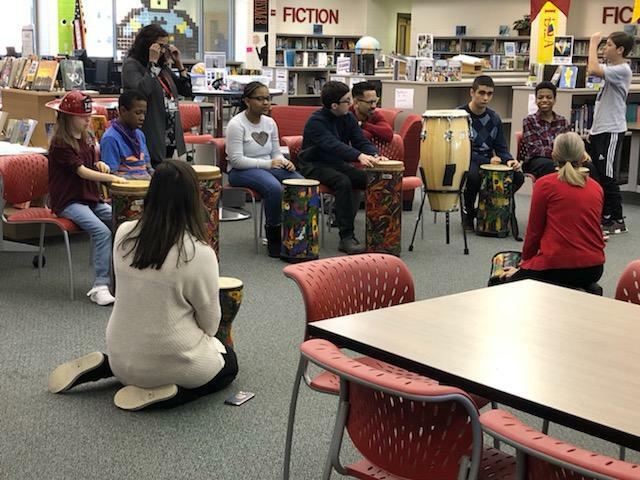 Students danced, sang and played instruments under the direction of music therapist, Brittany Taylor-Stewart, before joining their friends and family in the atrium for an art gallery and refreshments. Great job, Gladiators! 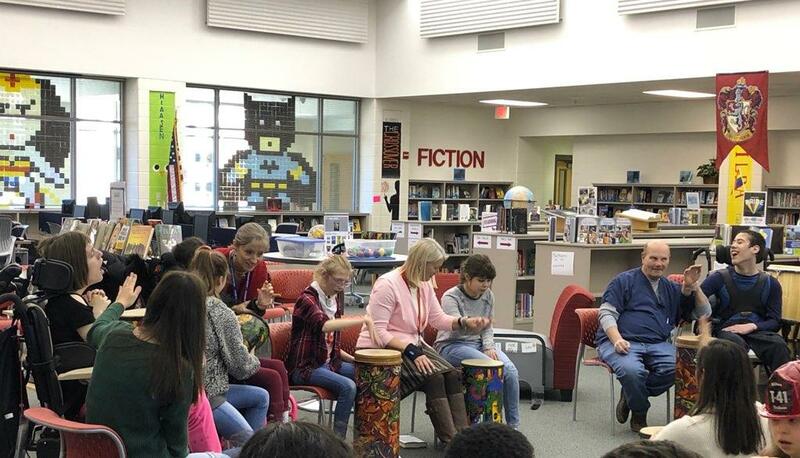 On March 14th, students at Liberty Point Elementary presented their ECW program “Put a Little Love in Your Heart” with help from our music therapist, Roy Joyner. 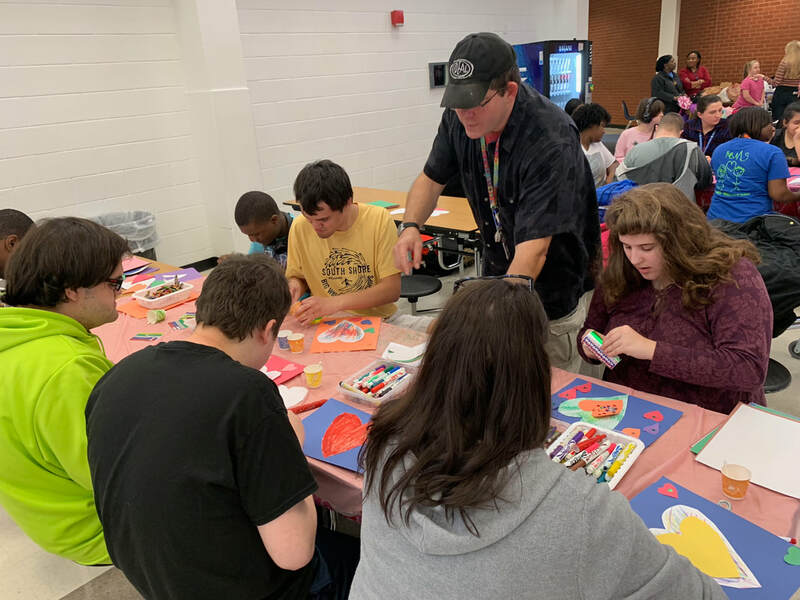 This program incorporated students and faculty which highlighted the diverse amount of instruction that students receive every week from Adaptive Art, Adaptive PE, Music Therapy, Occupational Therapy, and Speech Language Pathology. 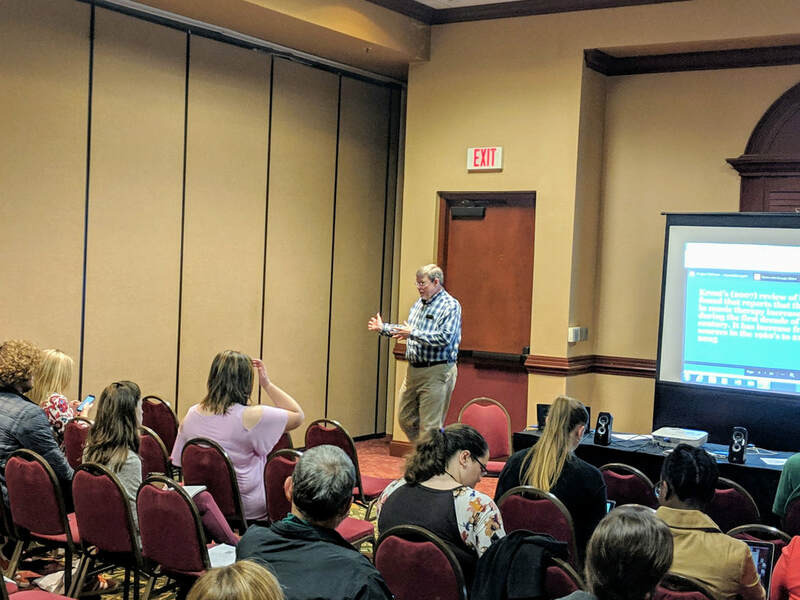 The music of “Motown” was used to emphasize the different disciplines to help give parents insight into how their students participate in each of these classes throughout the school day. Narrators were selected from speech only and visually impaired students to read the script which introduced each selection. An outstanding job was done by all! Go LPES Patriots! The students and staff of Alpharetta Elementary School “dabbed” their way through the decades and all the music genres for this year’s Exceptional Children’s Week show entitled, “On the Radio!” Under the direction of music therapist Kirby Carruth and other members of the special education team, the students participated in dancing, singing, and playing instruments. 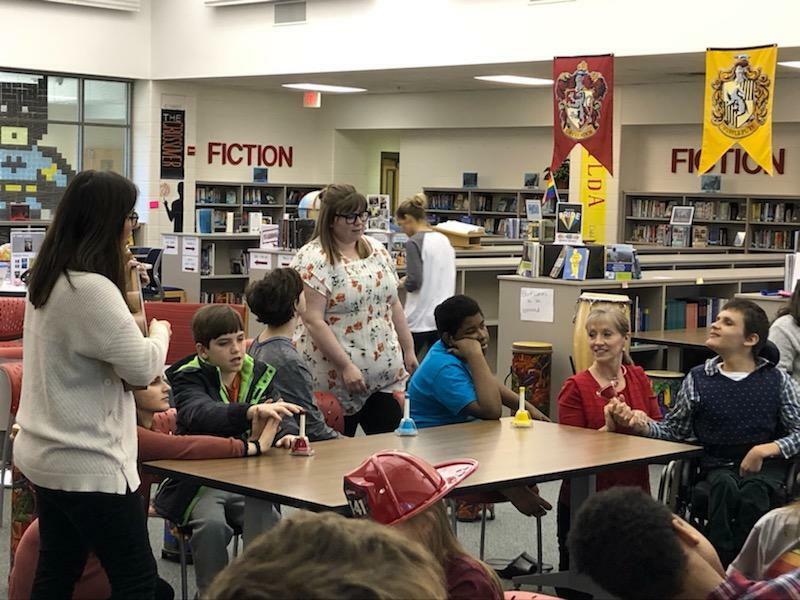 They even used assistive technology to communicate with the audience and give them the “Applause” and “On Air” cue with the help of some of our special friends. With hits from the 60s, 70s, and 80s- and all their favorite rock n’ roll, country, and hip hop hits, the students were able to showcase all of their unique talents and abilities for their family, friends, and their community. 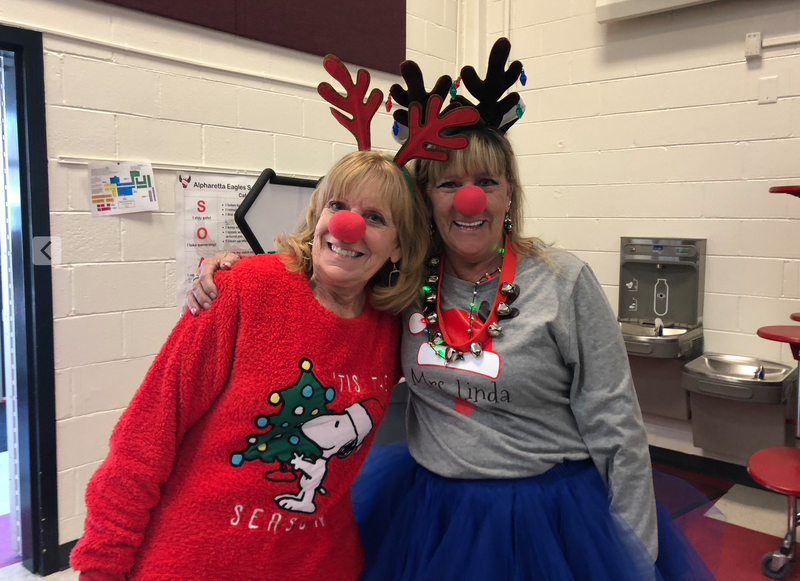 Additionally, to really get into the spirit of ECW, AES students and staff participated in spirit days this year, including Decades Day, Twin Day, and Pajama Day! On Wednesday March 13th, the Community Based Instruction (CBI) students ​at Chattahoochee High School participated in their annual show, Hooch Idol! 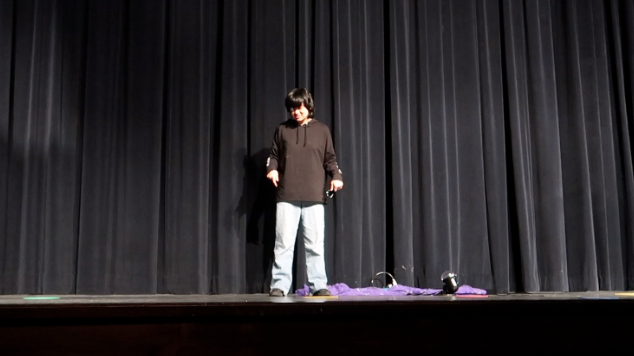 All different types of talents took the stage in the CHS auditorium including singing, dancing and comedy. The students practiced their talents for a more than a month with their music therapist, Brittany Taylor-Stewart. Bravo, Cougars, for a job well-done! 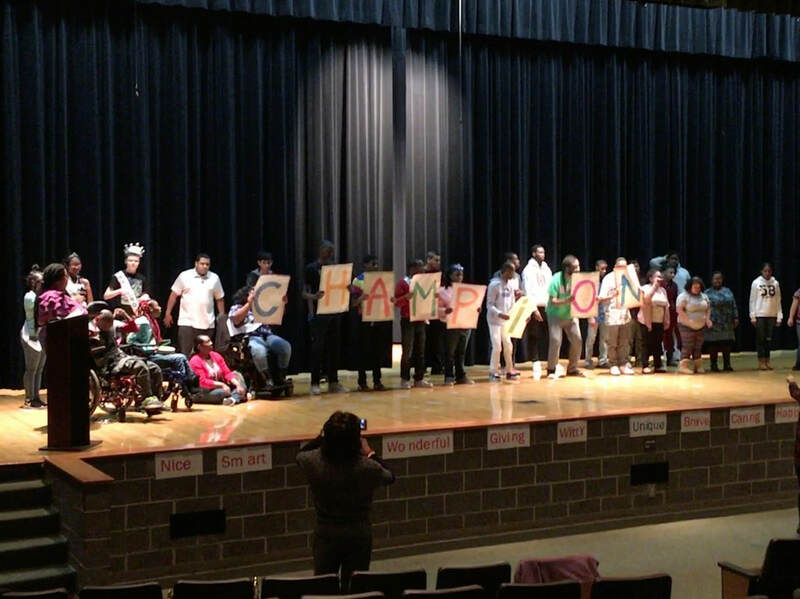 On March 12th, the Community Based Instruction (CBI) students at Northview High school participated in their yearly talent show, Northview Idol! 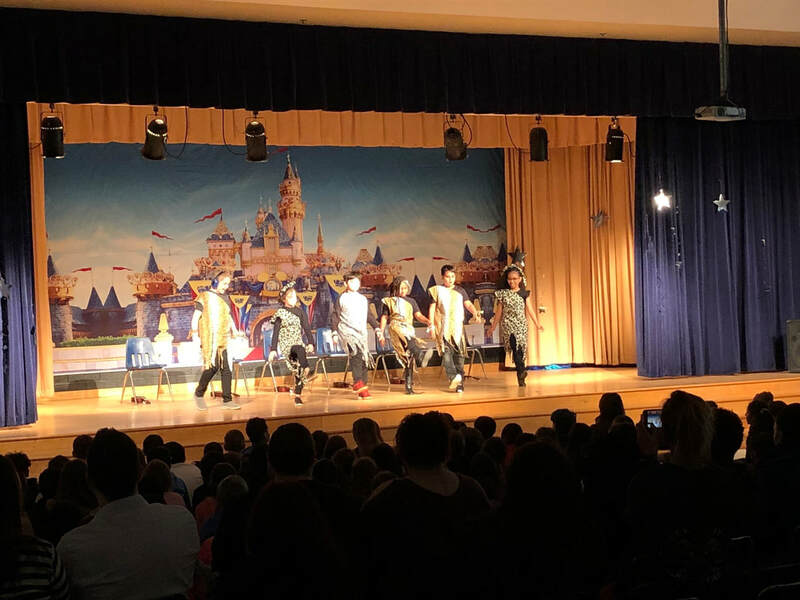 The students all dance and sang to individually selected songs through out the show under the direction of music therapist, Brittany Taylor-Stewart. The transition teacher at Northview, Carrie Orr, was our judge and all the students were awarded special awards at the end of the show. Way to rock out for another year, Northview Idols! 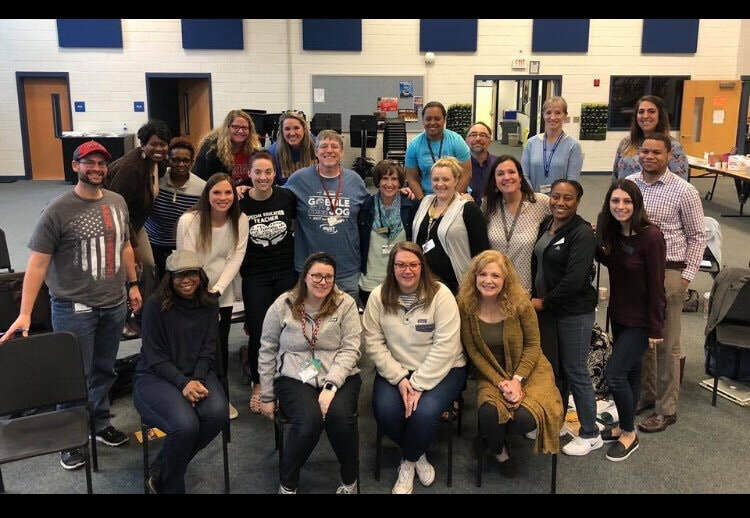 On Monday March 11th, the Fulton County Music Therapy team, some band/orchestra directors, and a few special education teachers met with Julie Duty, the founder and executive director of United Sound which is a program that will soon be implemented into some Fulton County High Schools. 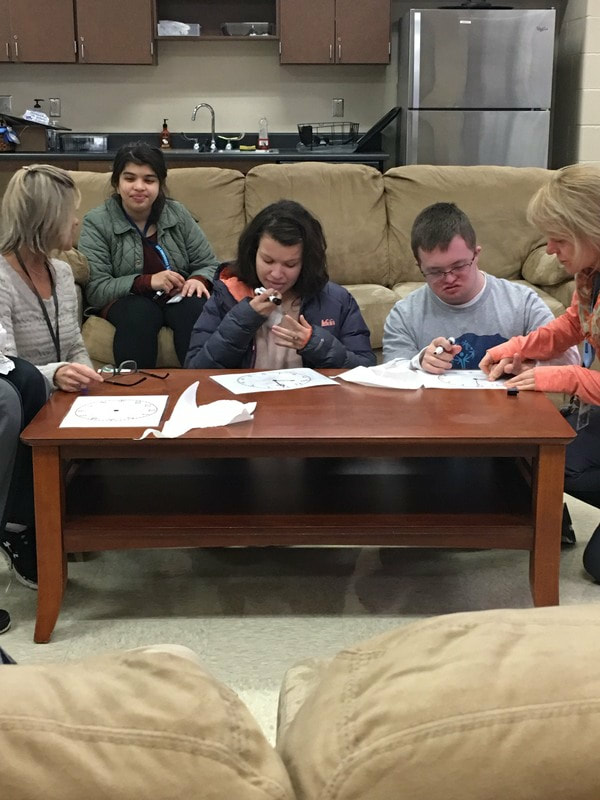 United Sound, Inc. is a nonprofit organization who mission is to provide musical performance experiences for students with special needs through peer mentorship. 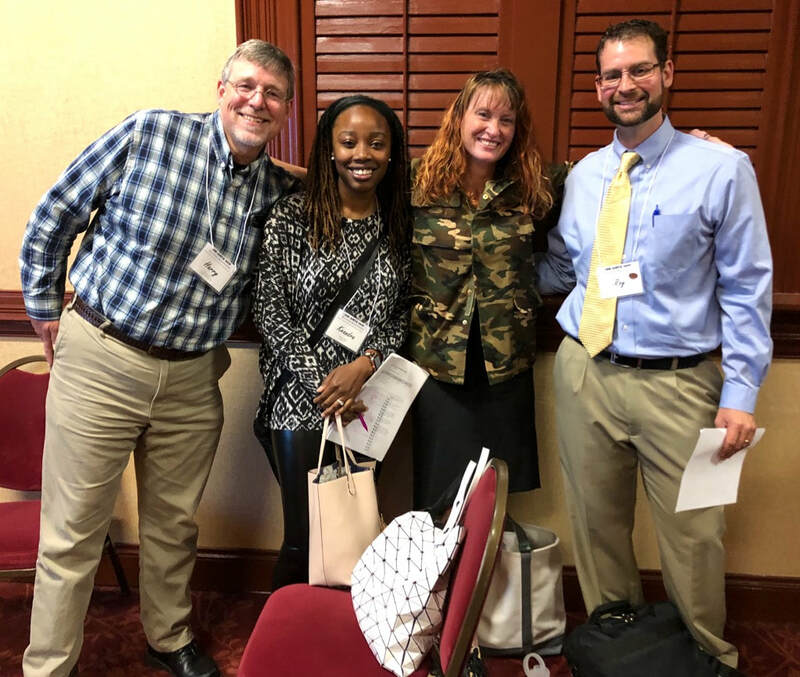 We are really excited to start this program in Fulton County Schools and can't wait to see what meaningful friendships are formed through it. You can check it out more at this link. 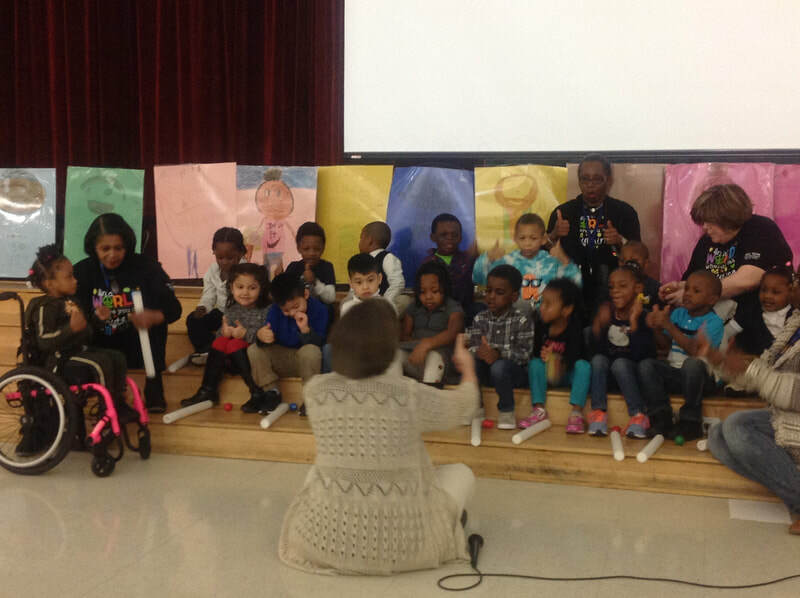 Wolf Creek Elementary school presented their 3rd annual Exceptional Children’s Week performance under the direction of music therapist Tasia Carter. 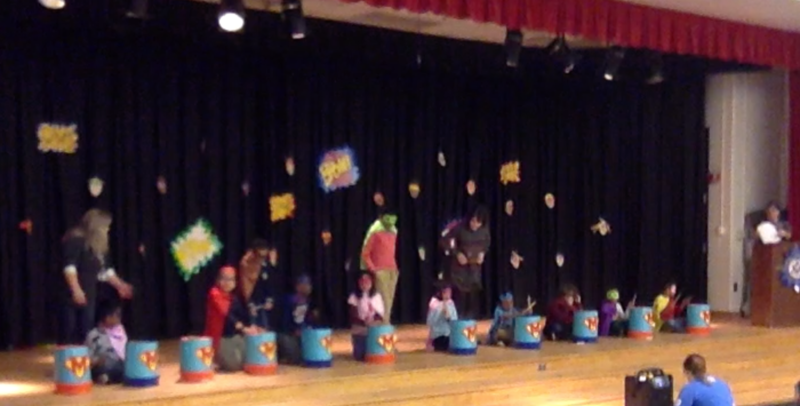 This year’s performance, “Everyday Heroes”, focused on the hero in all of us. 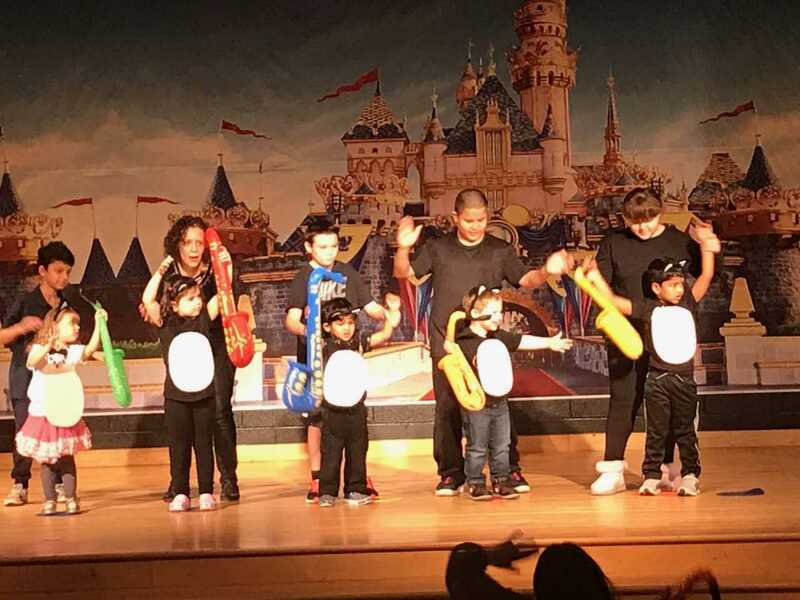 Students from preschool up to 5th grade showed their superpowers by representing different famous heroes through dance, instrument play, and even some tumbling! No task is too hard for these heroes. The show even gave a spot light to our community heroes. Way to go Wolf Creek! 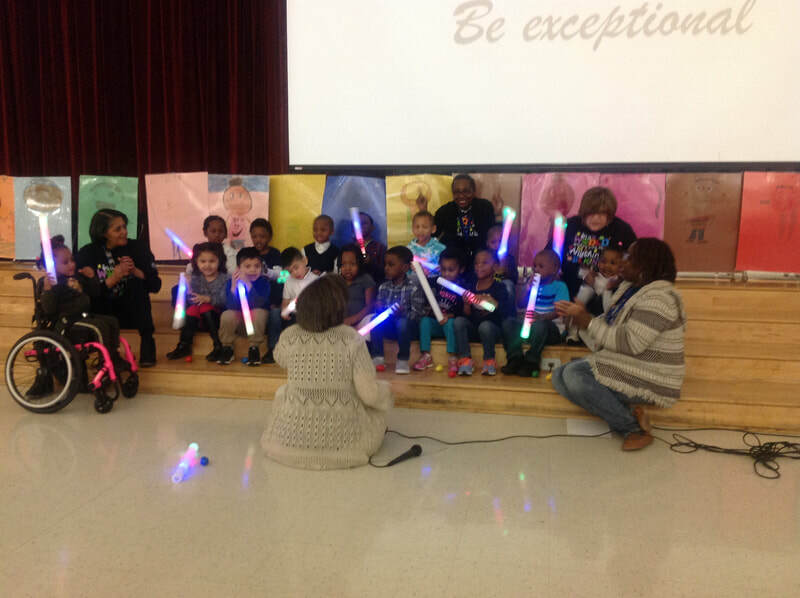 The lights were shining at College Park Elementary on Thursday March 7th! 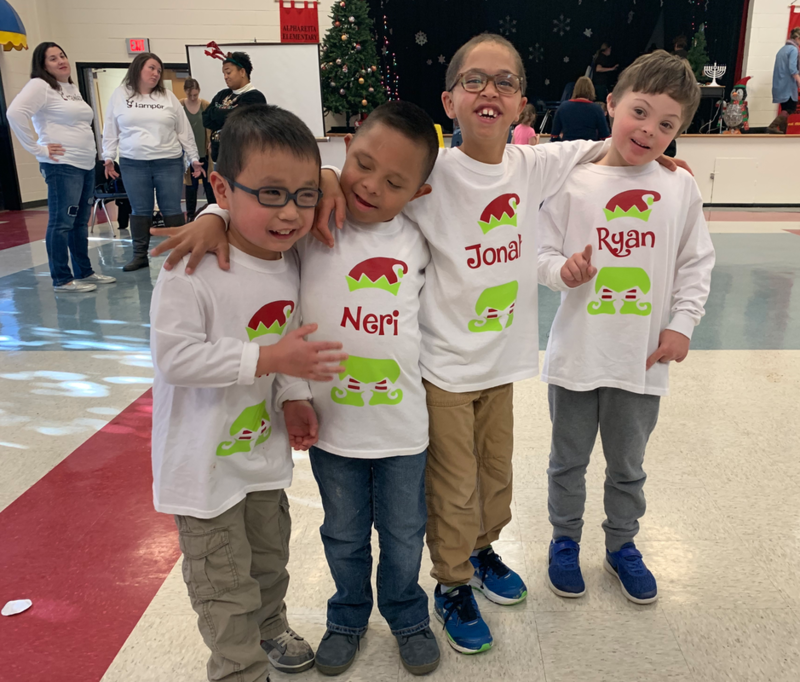 Preschool Special Education and Kindergarten Special Education students, with the help of music therapist Marsha Lane, worked on following directions, remaining on-task, along with singing and performance skills, during their “Yes, I Can” awards ceremony. The students sang, played shakers, and waved their light sticks as they performed the songs “I Can Be Anything” and “Light of Love” for their parents, staff, and peers. Nice job, College Park Tigers! Bam! Kachow! 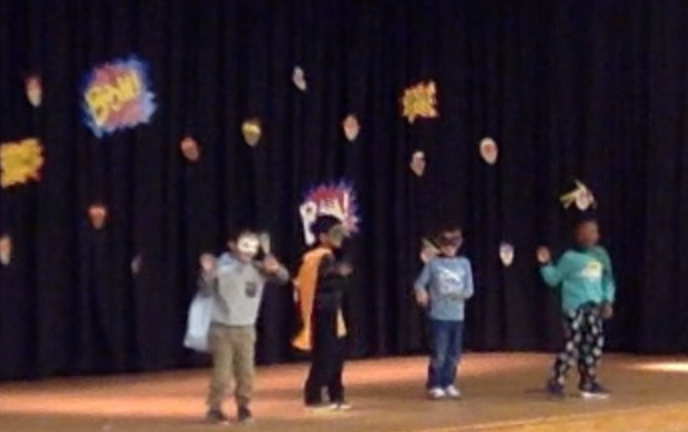 Lots of superheroes took the stage at Medlock Bridge Elementary on March 7th for their Exceptional Children's Week Show, "The Hero Inside Us." 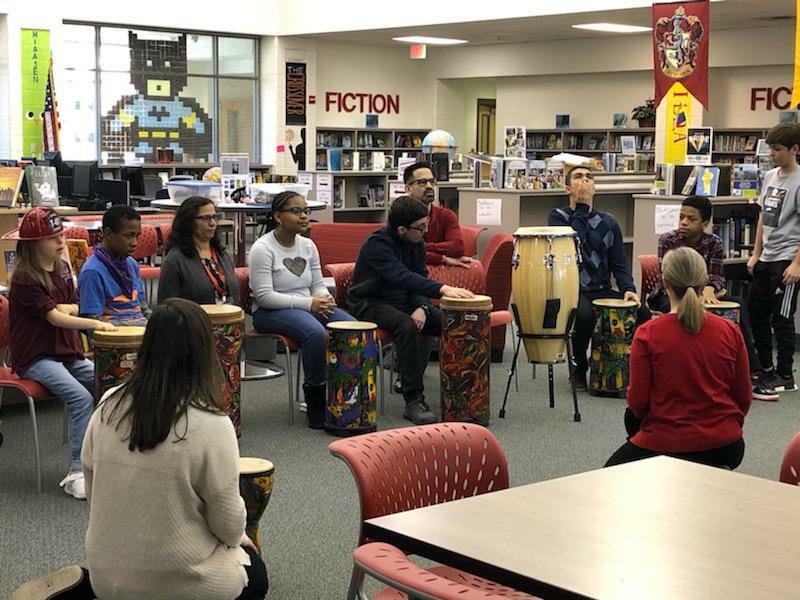 Under the direction of music therapist, Brittany Taylor-Stewart, the students danced, sang and played instruments to help defeat the evils that Medlock Bridge was facing. At the end though, everyone learned that you don't need a cape and mask to defeat evil because we can be everyday heroes by being kind, sharing, and doing little things each day to make the world a better place. Lights, camera, action! 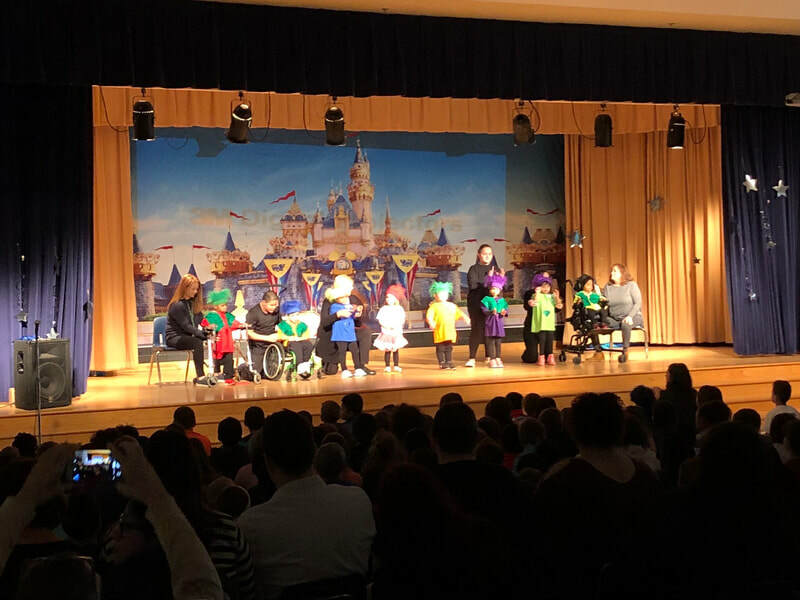 Under the direction of music therapist Emily Minkow, the students at New Prospect Elementary performed their annual Exceptional Children's Week show and this year's did not disappoint! Over 200 attendees took "A Trip to the Movies," learning about and seeing different animated movies in action. 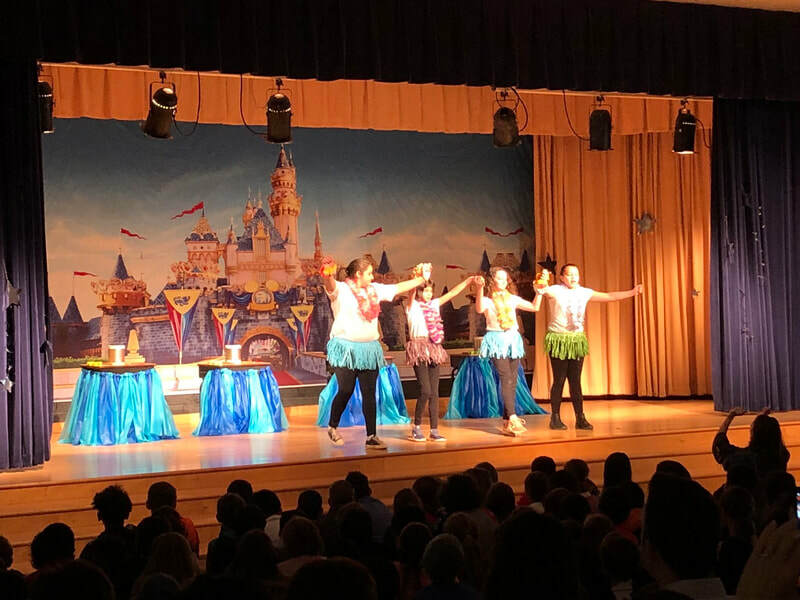 The performances included grooving with Trolls, hula dancing with Moana, playing ukuleles with cave men, getting jazzy with cats, and race car driving to name a few! Throughout the performance, Yes I Can awards were presented, and following the performance was a huge breakfast reception hosted by the PTA. The students did a great job displaying a glimpse of what they are capable of, and it was a morning to remember! 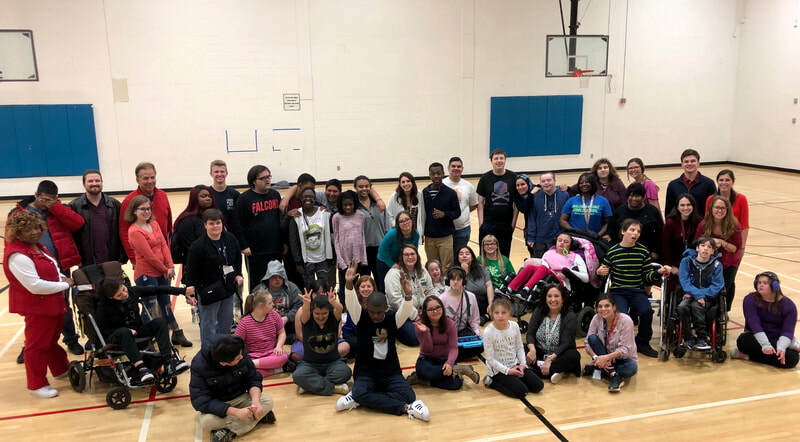 Community-based instruction students at Riverwood International Charter School put together a music video that displays a day in their lives. 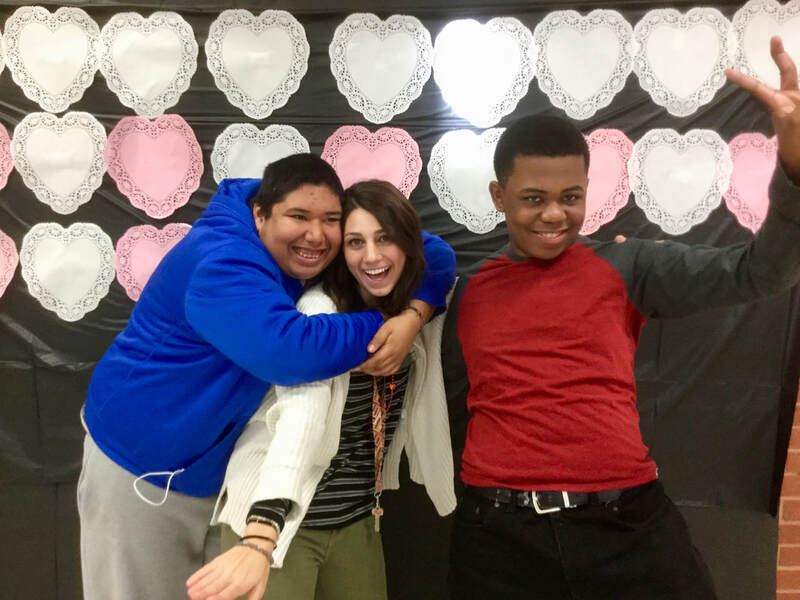 With the help of their music therapist, Emily Minkow, the students performed sign language to the song "A Million Dreams" from The Greatest Showman. 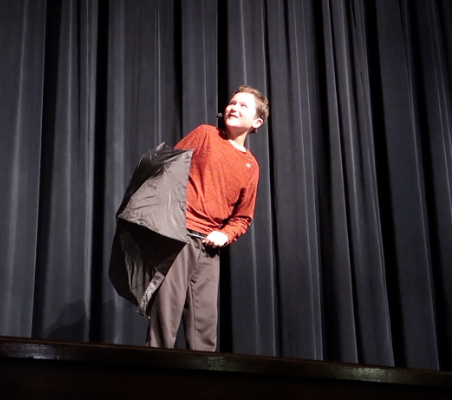 Check our their awesome video to celebrate Exceptional Children's Week! 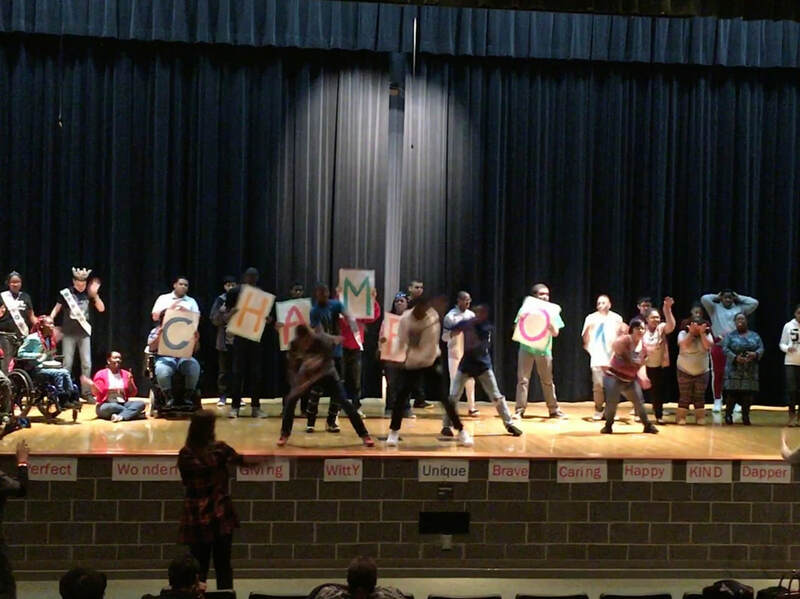 Students at Hopewell Middle School have been working for weeks on various songs to highlight their musical abilities. 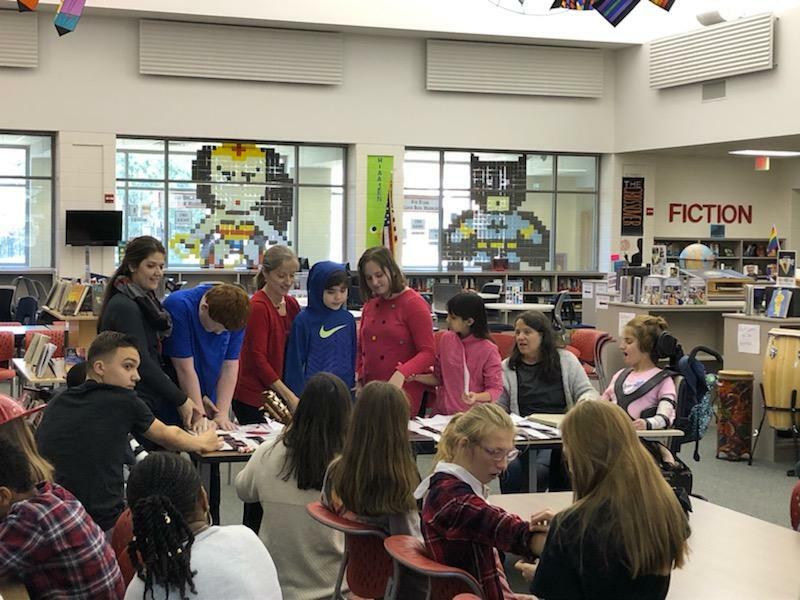 Led by music therapist, Stephanie Guest and music therapy intern, Erika Lowenthal, they performed their songs for peers, parents, and staff on Tuesday for Exceptional Children's Week. 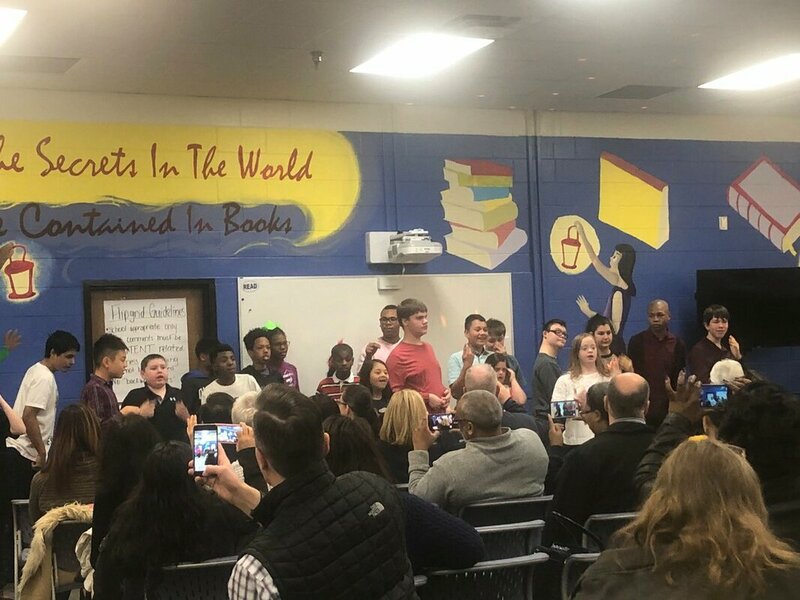 Under direction from music therapist, Brittany Taylor-Stewart, the music therapy students at Haynes Bridge Middle School participated in their annual talent show, Haynes Bridge Idol, on March 5th. 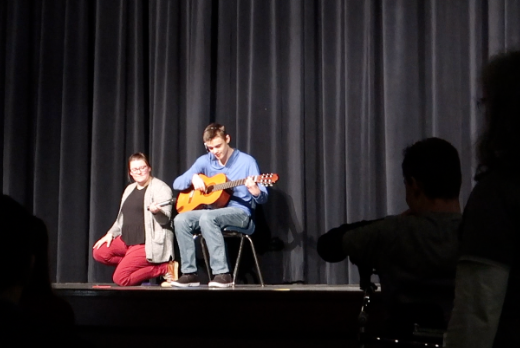 Students danced, sang, played instruments and some even showed some unique talent acts that they have been working on since January. 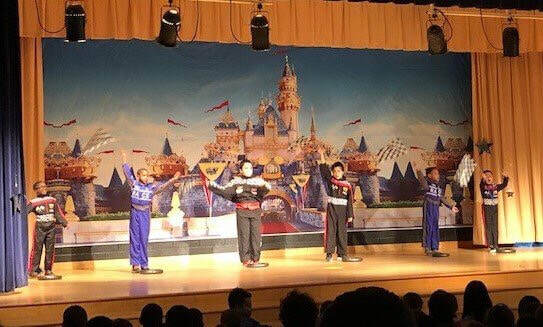 It was an incredible show and the students really worked hard to showcase their abilities in celebration of Exceptional Children's Week. 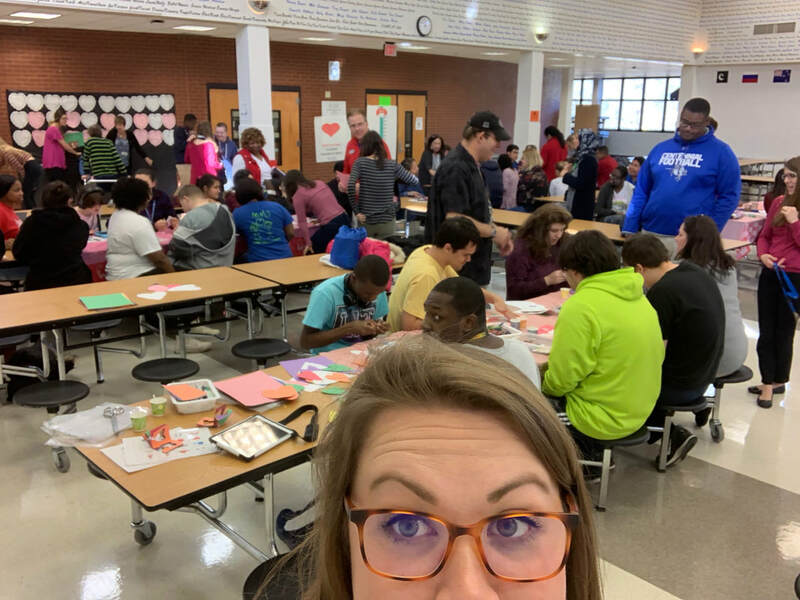 On Wednesday, February 13th Holcomb Bridge Middle School and Centennial High School shared their 3rd annual Valentines Social. 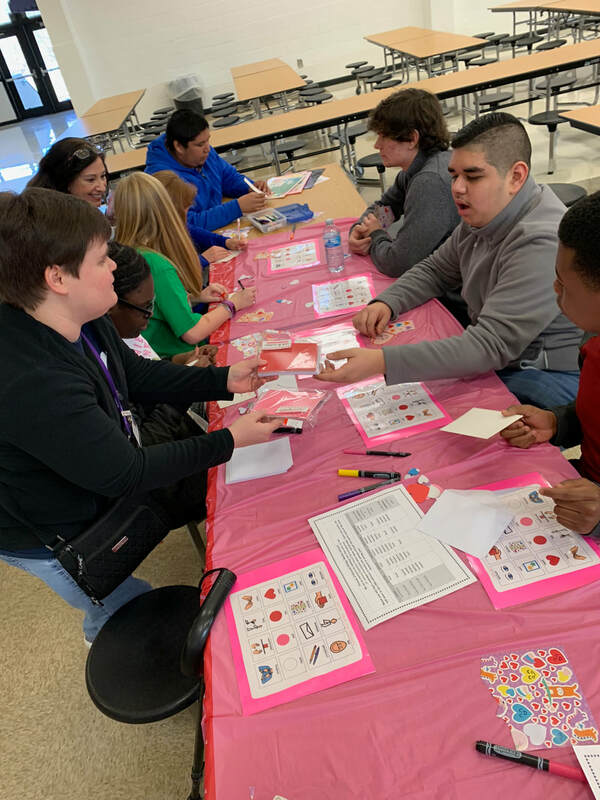 With help from the music therapists Kirby Carruth and Emily Minkow, as well as teachers and staff, the students moved from station to station making valentines and friendship bracelets, playing Love Song BINGO, taking pictures in the photo booth, face painting, and making a craft. The event concluded with a dance party, including a communal dance of the Cupid Shuffle. 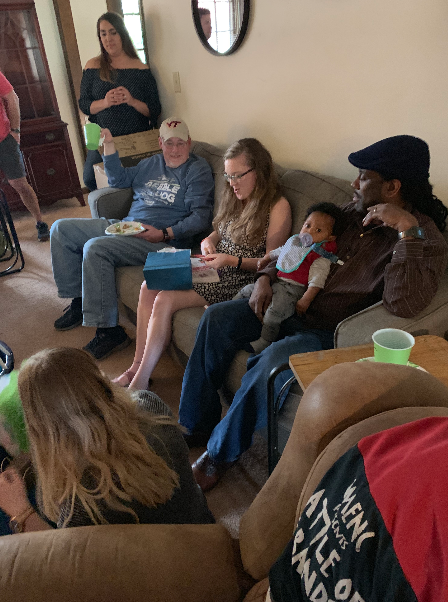 The students and staff continue to enjoy this yearly event, socializing with old and new friends! 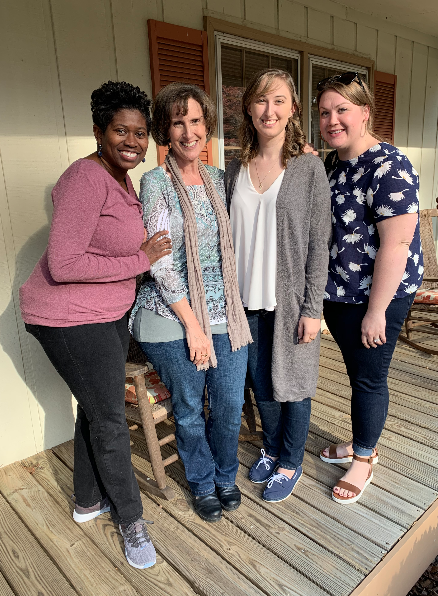 The Fulton County Music Therapy interns are on their final stretch of internship. They only have a little more than six weeks remaining in their internship with us. 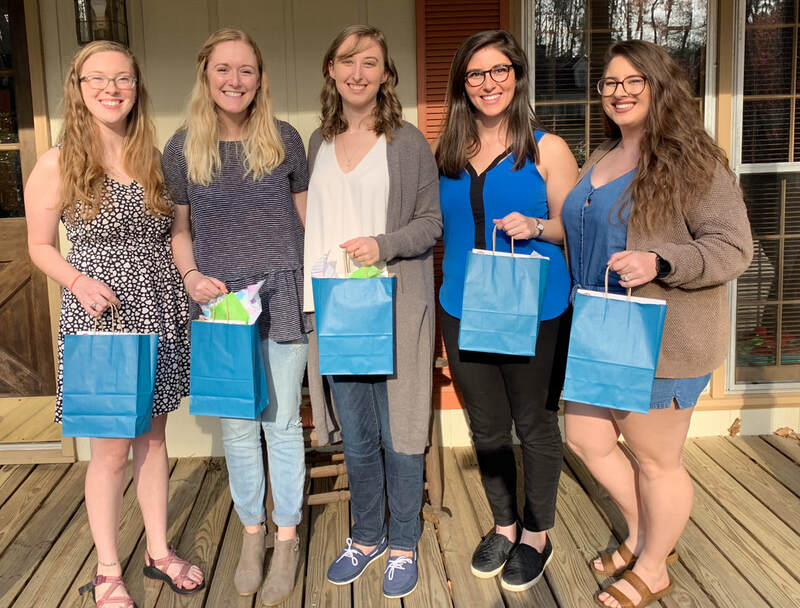 At this point in the school year, they are leading their full caseloads and prepping to enter the professional world as music therapists. 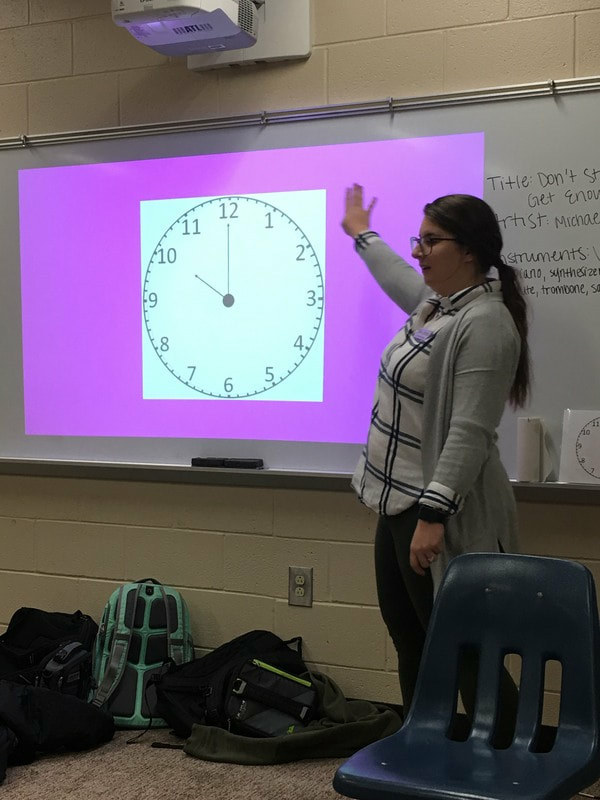 Pictured above is intern Carlee Efeney at Cambridge High School working on a music therapy intervention targeting toward telling time. 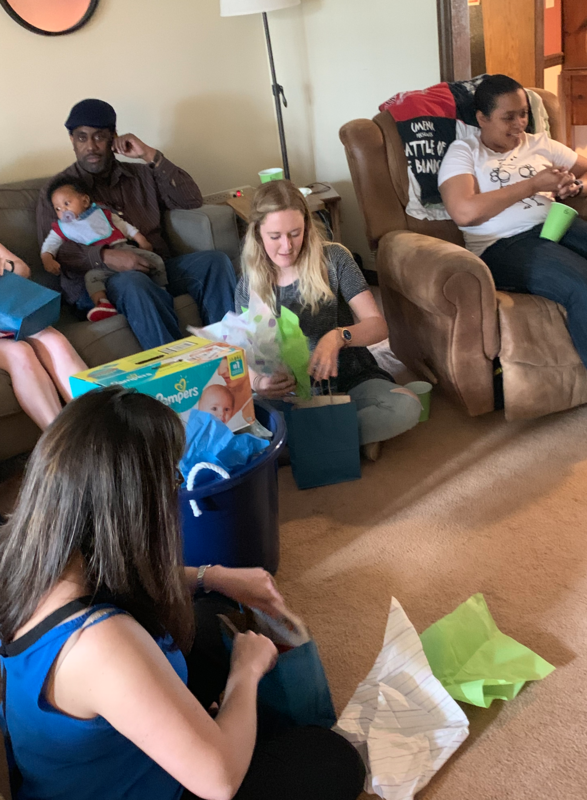 Pictures provided by music therapist Brianna Henderson. The music therapy team is busy meeting together at Centennial High School reviewing and analyzing music therapy assessments. It's in our vision to write a music therapy assessment as a department, so we decided to review all the literature that exists to start. The department split into teams and read various assessment and are reporting their findings during our professional development day for January. 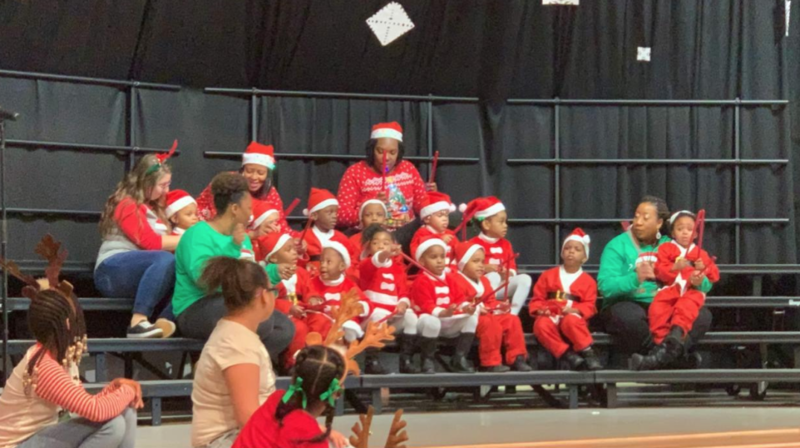 With music therapist Tasia Carter, Wolf Creek Elementary School’s Exceptional Children’s Department participated in the “Santa’s Playlist” holiday show in conjunction with the general music classes under the instruction of Casey Hall. This year the exceptional children classes were placed into three groups to perform three holiday favorites. The preschool special education classes performed “’Zat You Santa Claus?” by Dr. Teeth and the Muppets. This particular piece, while focused on performance, worked on attention to task, motor skills, and communication. Not to mention they were all dressed as Santa Claus. Next, the Autism classes performed “Comin’ Down the Chimney” by the Learning Station. This song worked on attention skills, motor skills, and listening. The students in the three classes gave a tremendous performance that resulted in an outburst of praise from the audience. The kindergarten special education class performed a thrilling arrangement of “Run Run Rudolph” by Kelly Clarkson. 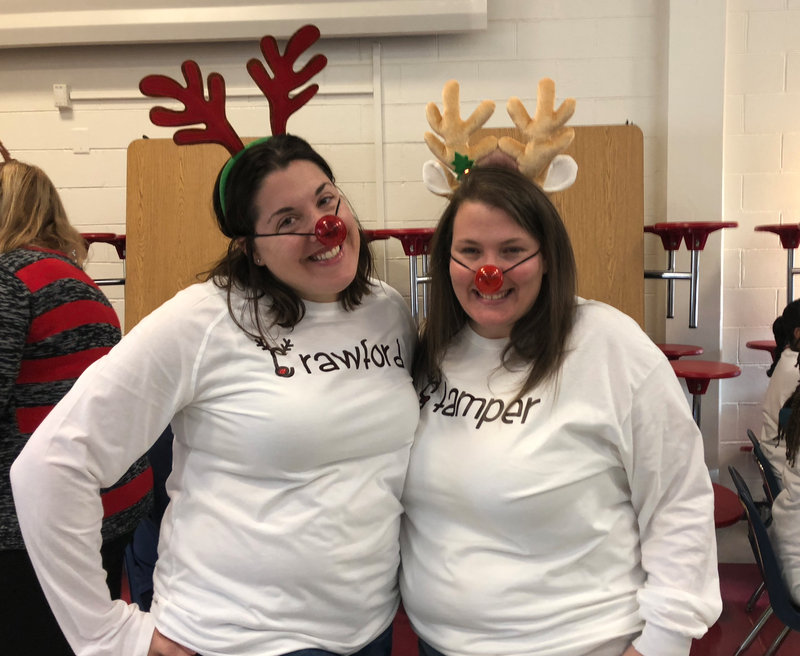 The students all wore reindeer antlers, played inflatable instruments, and frame drums. This song was the most demanding of all the classes. 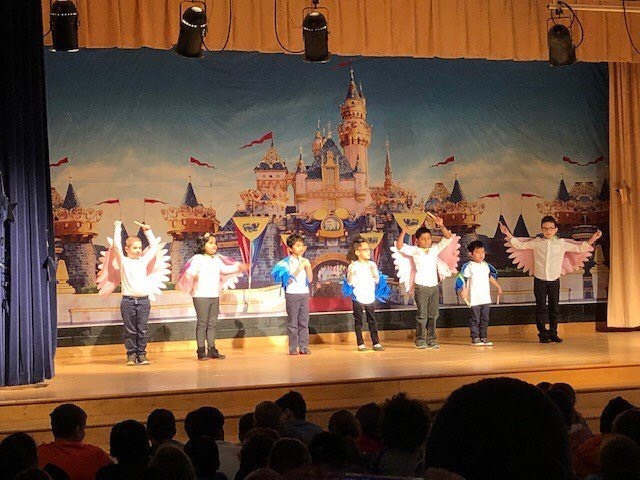 These students were required to stay focused, follow directions, watch for specific cues, use motor skills, and express themselves creatively through dance. The students had a phenomenal time and enjoyed performing for their peers! 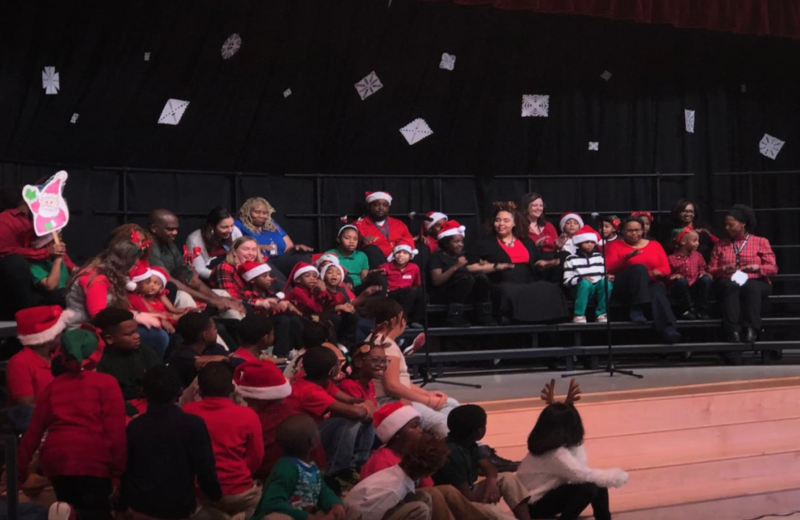 The students at Sweet Apple Elementary School participated in their annual holiday show with music therapist Amber Weldon-Stephens. The students worked on communication and motor goals, as well as music skills during the performance and practices. Ms. Amber was even able to recruit the alumni drum line to participate in the show. Congrats on a job well done, Sweet Apple! 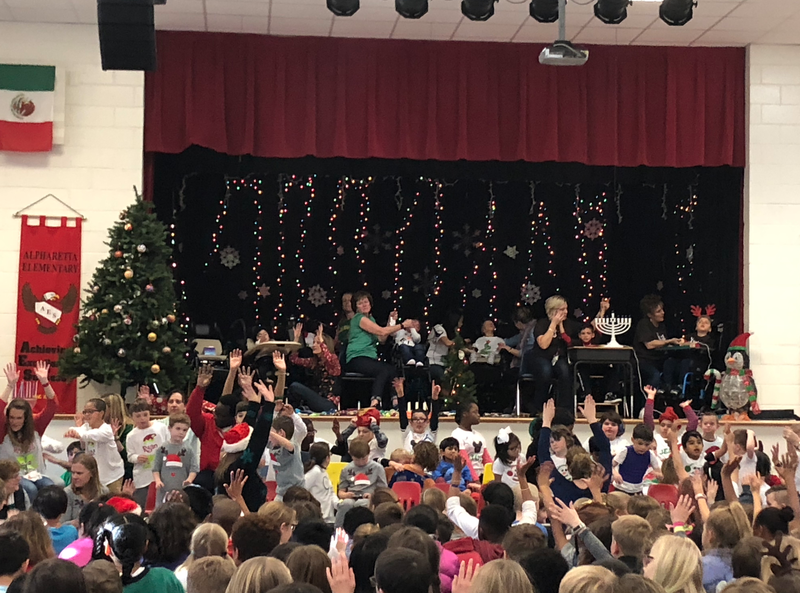 In keeping tradition, students at Alpharetta Elementary School also led a school-wide sing along for all of the students and staff- including some special reindeer visitors. 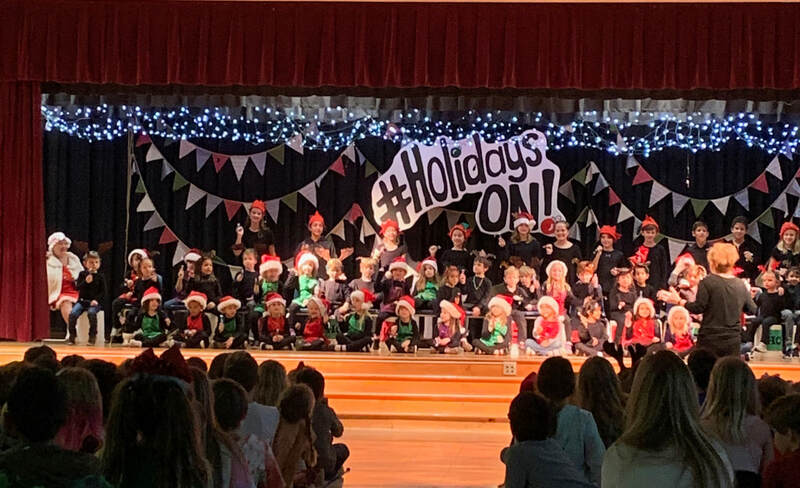 It was so fun to see many of our students up on stage this year under the direction of music therapist Kirby Carruth, utilizing power links and adaptive switches to create a winter wonderland of lights and sound! All of the students worked so hard, and are so thankful to continue this tradition each year. 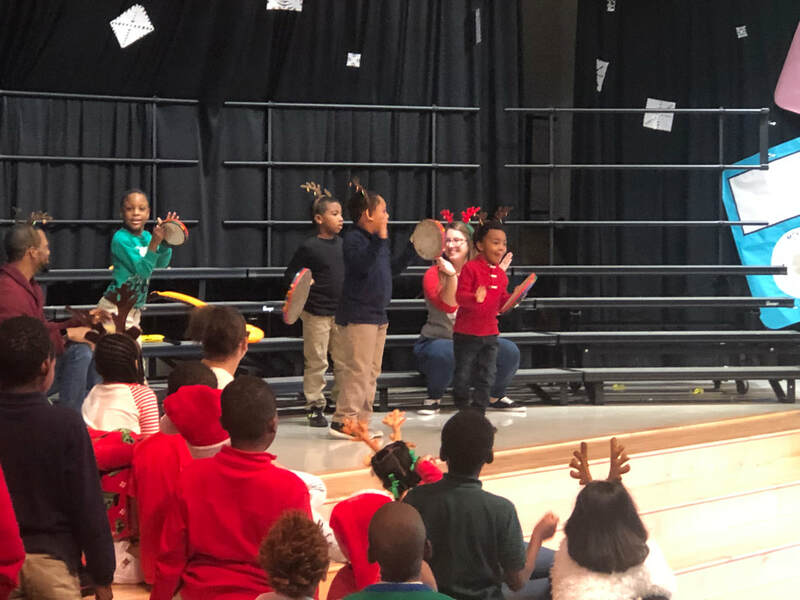 It was a festive holiday tour when students from Alpharetta Elementary School, under the direction of music therapist Kirby Carruth, performed their favorite holiday hits at the North Learning Center and Jackson Healthcare last week. To prepare for the fun field trips, students learned songs and incorporated turn taking, imitation of fine and gross motor movements, and following multi-step directions. Santa even made a visit to Jackson Health Care! 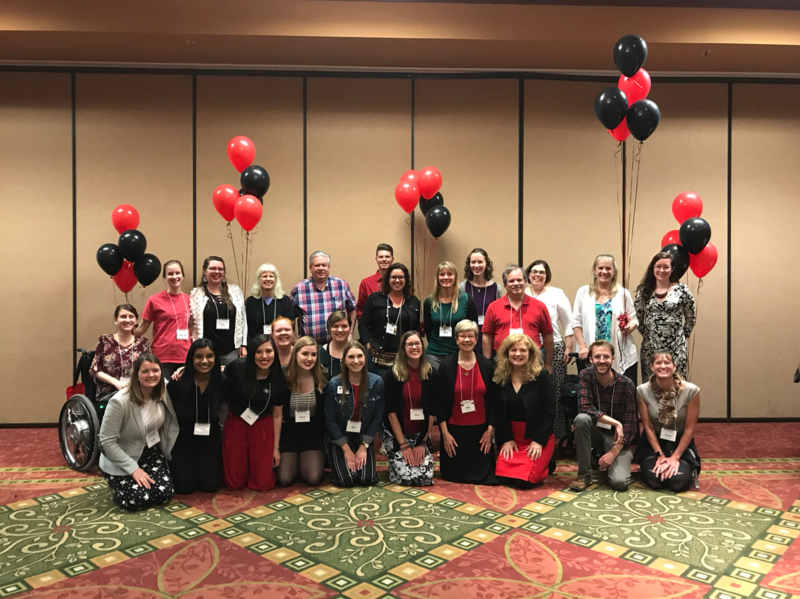 The teachers at Alpharetta Elementary School are so thankful for generous support and sponsors like Jackson Healthcare each year.